Born in Basle (Switzerland), swiss recorder player Muriel Rochat Rienth, coming from an artistic family (her great-grandfather was the swiss renowned painter Rodolphe Théophile Bosshard), finished her studies at the famous Schola Cantorum Basiliensis (solo diploma) with Michel Piguet. 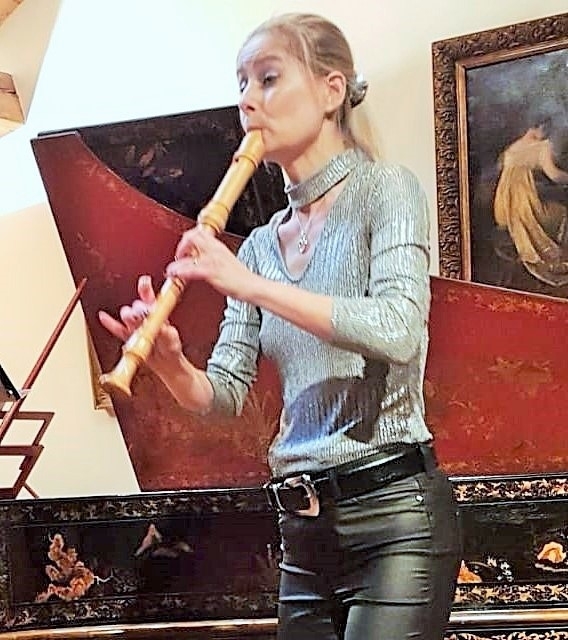 She plays regularly the important recorder concertos by Vivaldi, Sammartini, Telemann with different swiss orchestras and is the director of her own baroque ensemble, La Tempesta Basel, awarded with the swiss ORPHEUS-prize. Recent concerts include performances at Zurich Tonhalle, Concerts de Saint Germain Geneva, ADMA Fribourg, Basle, Festival Sacré de Sion, Société philharmonique de Bienne, Porrentruy, Lausanne and also in Italy (Festival Magnano/Piemont), Belgium, Spain and Austria (Baroque Concerts Graz). She is also active in contemporary recorder music: austrian composer Viktor Fortin wrote and dedicated her a Cantata, premiered by La Tempesta Basel in Lausanne and recorded by Radio Suisse Romande. Muriel Rochat Rienth produced with La Tempesta Basel two CDs for spanish label Enchiriadis, both highly acclaimed by the international music press: in 2009 the Tenor Cantatas and Recorder Sonatas by J.C. Pepusch and, in 2014, the Tenor Cantatas and Recorder Sonatas by Telemann with her husband, tenor Felix Rienth, elected among the “10 best CDs of the month” by spanish magazine RITMO and described as an "excellent disc" by FANFARE (USA). German magazine "Klassik Heute" comparred Rochat Rienth's playing with the world-famous recorder player Michala Petri. Muriel Rochat Rienths CDs were broadcasted at different radio stations, such as Swiss Radio SRF 2, Radio Suisse Romande, Radio KLARA Brussels (Belgium), Concertzender Hilversum (Holland), Rundfunk Berlin-Brandenburg, Radio Bremen, NDR Hamburg, Radio SWR Stuttgart, Radio Nacional de España or Radio CKRL (Québec-City) of Canada and ABC Classics (Australia). In 2015 Muriel Rochat Rienth is presenting her recording of Händel's Complete Recorder Sonatas with harpsichord player Andrés Alberto Gómez, published by spanish label VANITAS, again elected among the "10 best CDs of the month" by magazine RITMO, the most important award of spanish magazine. Spanish National Radio RNE invited her to the official CD-presentation to Madrid. Her Händel-CD was also enthusiastically reviewed by different spanish, german, dutch, italian, swiss and US magazines (FANFARE). Next CD for VANITAS RECORDS include Telemann’s “12 fantasias” for recorder solo, published in 2018, again with enormous critical acclamation. In 2017 she realized her third album with baroque ensemble LA TEMPESTA BASEL and swiss tenor Felix Rienth, featuring an italian baroque programme. For swiss label VDE-GALLO will be published a CD with music of austrian contemporary composer Viktor Fortin. Muriel Rochat Rienth teaches the recorder at the Conservatoire de Fribourg (Switzerland) and lives in Basle. She plays exclusively recorder instruments made by swiss Ernst Meyer ( † 2016).